Size: 2 x 160 sq. ft.
Low-maintenance green roof installations provided a hands-on learning experience for city Parks staff and a means to keep the internal temperature of storage units cool. To keep cool the interior of two shipping containers over the summer, the City of Calgary Parks department tasked our team to build a green roof on top of them. 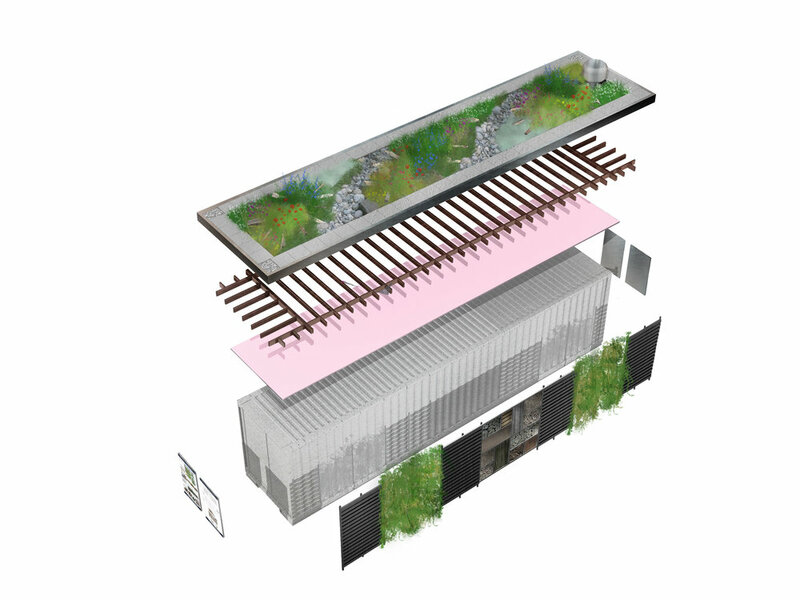 Taking into consideration the site’s specific conditions, we designed two xeric green roofs in different types of assemblies: LiveRoof Modules and Sopranature loose-laid system. To improve rainwater management, we created mounds and dry drainage rills. This project served also as a great opportunity for Calgary Parks’ staff to learn about green roofs. Our team led a learning-by-doing exercise, helping familiarize staff with extensive green roof technology. The biodiverse habitat of the site, as well as the adjacent honeybee hives also illustrated aspects of the City’s Biodiversity Action Plan.